Hey, you'll save time by not washing them! These jeans ($269) by Nudie Jeans Co. are so upscale, they thumb their little jean-noses at your pedestrian washing machine. 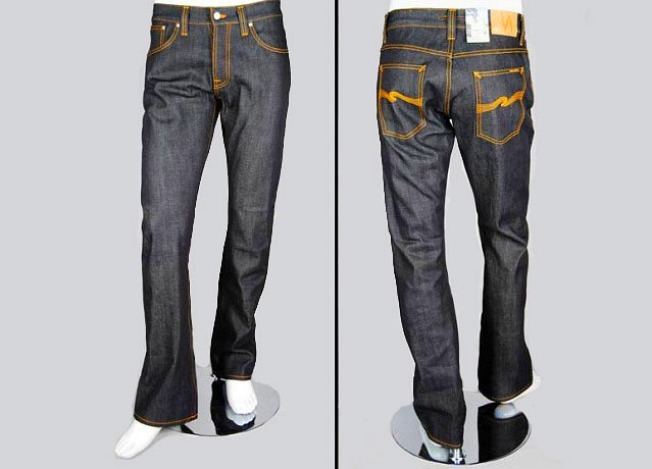 They're made of dry denim, which is "an unwashed denim treated with indigo dyes … For those uninitiated with dry denim, one should try to wear the jeans as often as possible and postpone washing them for as long as is tolerable (six months to a year). The end result is a completely personal wash," according to the Denim Bar Web site. We challenge you to a jeans-off! Actually, we guess it would be a jeans-ON. Available from the Denim Bar online or in stores at 1101 S. Joyce St., Arlington and 4939 Cordell Ave., Bethesda. Can't decide what color you feel like wearing? Try a pair of open Roberto Cavalli pumps, with shimmering straps of gold and chocolate interlocking over your toes. They're currently on sale from an unmanageable $699 to a slightly more budgetable $364.79. Add a dash of "Mad Men" to your pad! Pier One's Abacus chair ($199.95) is chunky, stumpy and wildly patterned, but who ever said those were bad things? Available online and in some local stores, but call 'em before going.